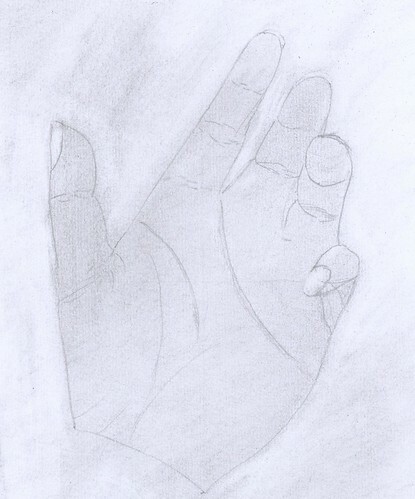 Foreshortened hand « T-Bird\’s crafty Blog! « How cute does it get? having had quite a break from the drawing with study taking up a lot of time, I’ve got back to it all today. So, today’s task? First balance your clear plastic view finder on your up-turned hand, close one eye, keep dead still and draw on round the image on your viewfinder using a dry wipe marker (or a nice water-soluble felt tip if you want something less chunky in your mitt!) Hey presto one perfectly proportioned 3D looking hand. Easy. Next, cover a drawing page with a light shading from a graphite stick, or in my case a graphite pencil cos I bought the wrong thing…. works fine but not quite as good as the real thing. Then copy your image off the viewfinder onto the page. Finally, put your hand back into the same position you had it in to copy it and finish off your drawing with all the little bits of detail. Way-hey a realistic looking hand! I was sceptical about this, the book says how you will be delighted by how wonderful your drawing will look yada yada and I thought u-huh? well lets just see shall we…. but you know what? I was dead impressed! It really did look like my hand! and it really did look like it was 3D! Aprilia gave it an A+ and, as my best critic I’ll take that as she thought it looked dead good too! This entry was written by tbird and posted on 17 October , 2007 at 8:50 pm and filed under The Daily Doodle. Bookmark the permalink. Follow any comments here with the RSS feed for this post. Post a comment or leave a trackback: Trackback URL.